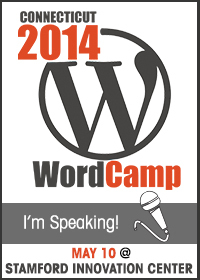 If you’ve never been part of a WordCamp, you’re missing out. Right now, you can still get tickets for an incredible day of WordPress classes for just $20. We have an amazing list of speakers with lunch included – and a t-shirt! How could you say no? Get your tickets now before they are sold out! http://2014.connecticut.wordcamp.org/ And yes, I’ll be presenting!